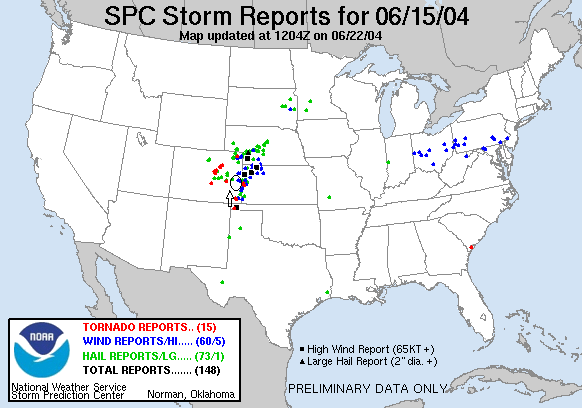 We started the day expecting to chase in Nebraska but were awoken to late night thunderstorms that scrambled the atmosphere and drastically reduced the tornado potential. We were left with the option of playing a pseudo-stationary front along the Eastern SD/NE border where the winds were best for rotating storms but where CAPE was low and moisture return was delayed or in Southeast Colorado where the CAPE was very high and the moisture was good, but the shear profile was weak. We chose the Colorado option and hiked all the way from York to south of Limon, CO where we intercepted a large tornado-warned HP supercell and followed it Southeast through Hugo, Boyero, and Kit Carson. Though the storm was tornado warned twice by radar, we were under the base both times it happened and the storm was not tornadic. The storm did produce a number of big gustnadoes and an incredible haboob, which we let run over us twice. The second time we recorded outflow winds in excess of 50 MPH according to my Kestrel, probably more like 60 MPH since we were just sticking it out the van door. Nice mammatus clouds under the anvil. Here comes the haboob. Van 1 in the outflow as tons of tumbleweeds fly across the road. The tour guests sample the outflow and get a nice dirt shower!